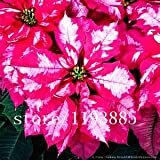 Live poinsettia plants for sale – You can find as cuttings grown in a container. 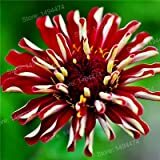 Consider buying a plant that is bushy and with lots of colorful bracts that are fully opened and not covered with pollen. Before buying a poinsettia for sale, remember that this plant is sensitive to cold. The ideal temperature for it is between 65 – 75 degrees Fahrenheit and they tend to drop leaves when exposed to a cold draft or to extreme changes in temperature. 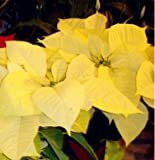 Aside from that, caring for your new poinsettia plant is relatively easy. You should place it in an area where it will receive at least 6 hours of bright indirect sunlight in a day. 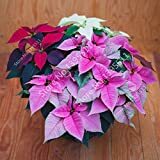 Plant it near a tree to benefit from its shade or grow your poinsettia plant indoors near the brightest window in your house. Poinsettia performs well in a slightly acidic, well-draining soil with a layer of organic mulch around its root zone to keep moisture in. For indoor planting, you may use the same soil it came in from the nursery or a well-draining potting mix if there is a need to re-pot the plant to a bigger container. Do not allow them to sit in water. Only water your plant thoroughly when the soil feels dry to touch. You should remove the water sitting on the draining tray as well afterwards. You can also give your poinsettia a balanced organic fertilizer every 2 weeks in the summer when you see new growth. A water soluble fertilizer mixed in water can be used as a replacement and mist every other week. 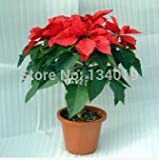 But avoid feeding your poinsettia during its blooming season. To keep your poinsettia plant in top shape, it is ideal to prune in the spring by cutting the plant back to 6 – 8 inches tall. Also pinch back stems as they grow in the summer to encourage branching. Outdoor poinsettias tend to grow taller and leggy. You can schedule a regular trimming to prevent this. 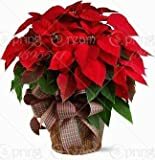 Why is your poinsettia plant not blooming? Here is a secret: poinsettias bloom in response to shorter days. In order to make them bloom just in time for the holidays, put your plants in complete darkness for 12 – 15 hours per day for about 8 – 10 weeks prior to the desired bloom time. This also means that you can make them bloom anytime of the year by doing this treatment. You can use a black plastic bag or a thick cardboard box to cover your plant. Make sure that there is total darkness because even indoor lighting will disrupt the blooming process. Remove the covering during the day and make sure your poinsettias get at least 6 hours of sunlight. You should see flower buds emerging on your poinsettia after the 8 – 10 weeks of darkness treatment. Discontinue the treatment once you do and bring it back out to your window or garden. Continue watering but stop feeding until spring comes. 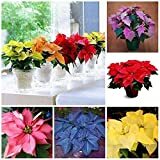 Enjoy the your poinsettia blooms just in time for the holidays!